This volume collects issues #6-10 of the Oni Press series Rick and Morty. The hit comic book series based on Dan Harmon and Justin Roiland s hilarious [adult swim] animated show RICK & MORTY continues! Catch up on the adventures of degenerate genius Rick Sanchez and his bumbling grandson Morty as they explore the outer reaches of time, space, and decency. This collection features issues #6-10 of the comic book series, including the Ball Fondlers Special by guest artist Andrew MacLean, A Very Special Blumbus, illustrated by series writer Zac Gorman, and a cyberpunk adventure across the multiverse. Plus: bonus mini-comics showcasing fan-favorite characters! 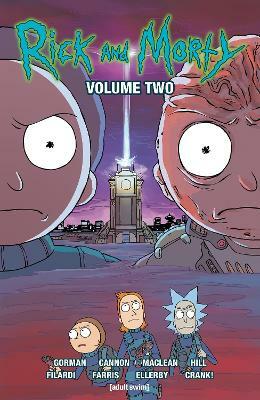 BOOKLIST-This second installment of Gorman and company's series opens on an uncharacteristically sunshiny scene of Rick and Morty building a car for a soapbox derby. That moment, however, is short-lived: a horrid, gelatinous creature suddenly appears and gores Rick with a barbed tentacle. With his dying breath, Rick gurgles, It's starting. A few dimension-hops later and another Rick and Morty are traveling to the only Rick-free corner of the multiverse to wait out the massacre of all Ricks. But is a universe with only a Morty as safe as it might sound? As in the first volume, nihilistic jokes and obscure pop culture references abound, but the absurdity of those over-the-top allusions is always played for laughs. Questions of causality and ethics arise, but they are gleefully thrown aside in favor of crude irreverence and candy-colored vulgarity. Cannon's artwork nicely replicates the visual style of the cartoon, from Rick's drunken, wonky eyes to the grotesque interdimensional creatures that pepper the pages. Brainy older teens with slightly twisted senses of humor will appreciate this. Zac Gorman is a cartoonist from Detroit, MI, raised on the sacred suburban triumvirate of video games, cartoons, and comic books. He's the creator of the popular webcomic Magical Game TIme and has worked on several animated television series as a storyboard artist and character designer. Zach currently resides in Chicago with his far more talented wife and a furry little monster who most people mistake for a cat. CJ Cannon is a self-taught artist living in Nashville, Tennessee. When they're not working on comics, outside riding their bike, or drumming, they're almost always in the house drawing fanart. Marc Ellerby is a comics illustrator living in Essex, UK. He has worked on such titles as Rick and Morty, Doctor Who, Regular Show and The Amazing World of Gumball. His own comics (which you should totally check out!) are Chloe Noonan: Monster Hunter and Ellerbisms. You can read some comics if you like at marcellerby.com.